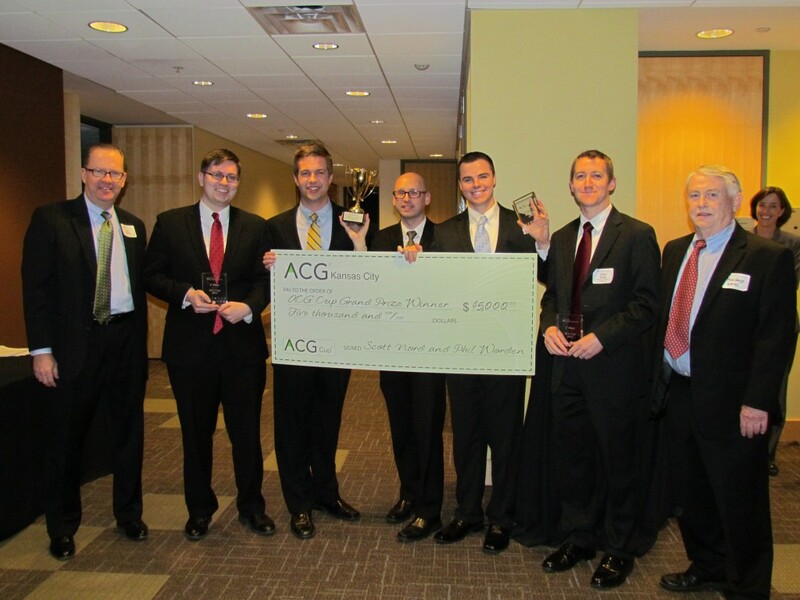 KANSAS CITY, MO — A team of graduate finance students at the Henry W. Bloch School of Management beat Rockhurst, KU and K-State, taking home the top prize in the first annual Association for Corporate Growth (ACG) Cup – Kansas City. The competition was held at American Century Investments in Kansas City on April 10. Pictured, from left, Phil Worden (B.B.A. ’89, MBA ’93), executive vice president, Bank of America Merrill Lynch; Ryan Prescott, student; Jacob Willis, student; Ryan Swartzlander, student; Derek Bembry, student; Dr. Nathan Mauck (faculty advisor), Dr. Fred Hays (Chair, Bloch School Department of Finance). ACG is a major national organization of finance professionals, and the newly developed ACG Cup competition requires students to present their analysis of a business valuation case to a distinguished panel of judges from investment banking, private equity and investment firms. The case itself, a proposed leveraged buyout of an auto dealership, was developed by global investment banking firm Houlihan Lokey. Bloch School alumnus Phil Worden (B.B.A. ’89, MBA ‘93), senior vice president of Bank of America Merrill Lynch, helped organize the ACG Cup competition locally. The Bloch School team was made up of Ryan Swartzlander, Derek Bembry, Ryan Prescott and Jacob Willis, under the faculty advisement of Bloch assistant finance professor Dr. Nathan Mauck. According to Mauck, the judging criteria was based on presentation quality, analysis, creativity, and teamwork. “The Bloch team scored high in all categories. They were polished, prepared, and energetic in their presentation,” he said. The victorious Bloch team won $5,000 and will go on to compete at the regional ACG competition in St. Louis this May. They will be introduced and recognized at the ACG breakfast meeting April 19 at the downtown Marriott, where UMKC Chancellor Leo Morton will be the featured speaker. In addition to their ACG victory, Swartzlander and Bembry were also members of the Bloch School Quiz Bowl team that finished second to Georgetown at the recent Financial Management Association Leadership Conference in New York City. Click here to learn more about graduate finance education at the Bloch School. The Henry W. Bloch School of Management strives to be Kansas City’s nationally and globally preeminent school of management, focusing on entrepreneurial and innovative thinking as the foundation for transforming talent and achieving sustainable growth in for-profit, public and nonprofit enterprises. This entry was posted in Archives by . Bookmark the permalink.